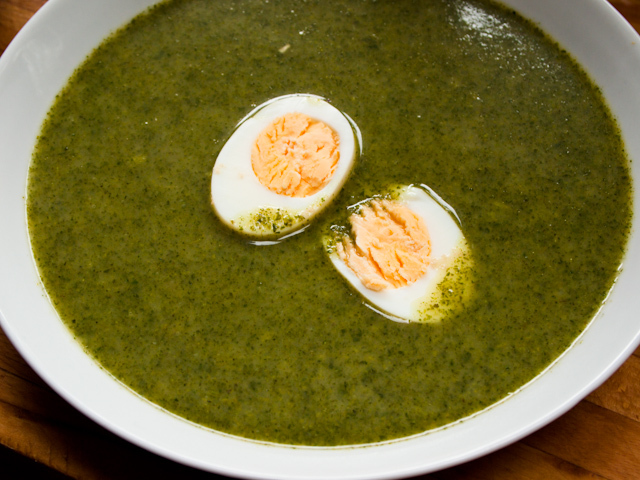 A spring institution is nettle soup made with the soft tops of young nettles. I went out in red rubber gloves to pick a bowlful of these delicacies from the abundant supply in our garden, brought them in, washed them thoroughly and spun them in a salad spinner to get rid of all the little bugs and dirt that hide in their textured leaves. Picking and washing the nettles is the time consuming bit – the soup is a doddle to make. I’m glad to see you’re attempting to make a Swedish soup, since I’m Swedish myself, but I’m sorry to say that what you cooked was not Swedish nettle soup. You don’t sauté the nettles and you don’t use onions. The Swedish nettle soup is made by throwing in the carefully washed nettles (no need for spinning them) in boiling salted water (not cold water because then the nettles will lose their green color) and boiling them for 15 mins, at which point they should be mushy. Then you separate them from the water with a colander and rinse them with cold water (also for the color). Carefully squeeze excessive water from the nettles and chop them very finely together with a little bit of chives and sometimes, chervil. Then you gently fry butter and flour together in a saucepan for a brief moment and add chicken or veal stock and let it simmer for about 10 mins. Add the finely chopped nettles and chives, season the soup with salt and pepper, and let it all simmer for 5 more mins. Serve with a halved boiled egg. Done! Oh, actually I made a mistake you wouldn’t use stock, well you could, but the best thing is to use the water in which you boiled nettles. Then you get the maximum taste of nettles and nothing else.